Posted on 18, May 2016 by EuropaWire PR Editors | This entry was posted in Chemicals, Industrial, Netherlands and tagged AkzoNobel, Mauricio Bannwart, Oscar Wezenbeek, performance coatings plant. Bookmark the permalink. 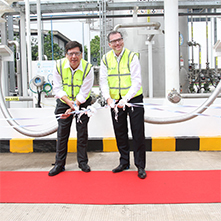 Cikarang, Indonesia, 18-May-2016 — /EuropaWire/ — AkzoNobel has completed phase one of the €2.5 million expansion of its performance coatings plant in Cikarang, Indonesia. Speaking at the recent inauguration ceremony, Mauricio Bannwart, Managing Director of AkzoNobel’s Protective Coatings business, said: “This investment is a testament to our commitment to Indonesia, which continues to improve its position as an emerging market. Having first established itself in Indonesia in 1971, AkzoNobel has since become the largest paints and coatings producer in the country. The company operates three manufacturing sites, supplying both decorative and performance coatings, employing more than 1,000 people.